… and today, that’s what we’re going to show you. The best thing you can do for your guinea pig is to give it 24-7 access to high-quality hay. If you are in a hurry we have listed our top pick for the best hay you can get for your guinea pig next and below that, we go into much more detail. 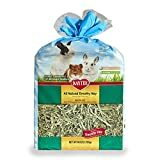 Small Pet Select 3rd Cutting "Super Soft" Timothy Hay Pet Food, 10 Lb. Guinea pigs are rodents which means their teeth are always growing. Now, the million-dollar question becomes: What kind of hay should you feed your guinea pig? In addition, you need to feed your guinea pig hay that is soft and more grass-like as compared to stiff hay that is more straw-like. With these considerations in mind, as well as “how much the guinea pigs like the different types of hay”, we have found the three best options below when it comes to guinea pig hay. Grass hay should be available to guinea pigs at all times. It provides them with fiber to keep their digestive system healthy and helps grind their teeth to prevent it from growing too much. Timothy hay is the best and most recommended hay, especially to adult guinea pigs. It contains just enough calcium so you won’t have to worry that about your pet developing stones. 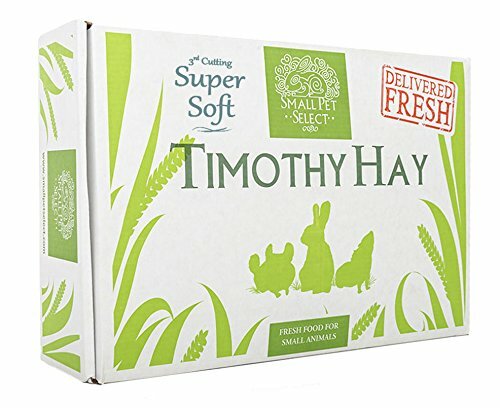 The Third Cutting Super Soft Timothy Hay from Small Pet Select is contains less stem and seed than the second cutting. It is the company’s softest timothy hay that even the pickiest eaters will start to enjoy eating hay. Hay with this kind of quality is rare and is difficult to find. Like what the company says, it’s a “gift” from Monther Nature. Not a given. We love not just the product, but also the company that sells it. They pride themselves to proving that they want the best for our pets by creating small batches of their product to make sure that only the finest products are delivered to us. Just like the first item on the list, this one is also from Small Pet Select. This is the First cutting of Timothy Hay and has more flower head and pliable stem which means that it has a higher fiber content than any other cutting. Like what was mentioned earlier, Small Pet Select proves their genuine care for our little pets by providing the only the best timothy hay. Their products are hand-selected to find the highest quality products to deliver to you. That is why, their hay is difficult to find because as they say, hays are not created equally and what matters is the quality. Many guinea pig owners love the products from small pet select. A lot of them say that their pets go crazy for it and it is the only hay that made them to actually eat hay. This Timothy hay from Kaytee is all natural and is in wafer cut. The wafer cut is supposed to peel off in layers to make feeding easier and to lessen the mess. Kaytee timothy hay is hand-selected as well to make sure that long fiber strands are selected and that there is a proper leaf to stem ratio to support the health of the guinea pigs’ digestive system. The hays from Kaytee are grown from an ideal ecological setting to control moisture and climate and then stored in a protected environment where its quality, freshness and nutritional value can be maintained. Basically, all the timothy hay offers the same quality and nutritional value. The only difference is the location and way on how they were grown and harvested. For this product, one of its differences is its cut which many guinea pig owners say very helpful in keeping the mess under control. As we all should know, Alfafa hay has a higher calcium content than Timothy hay and is best to be given to pregnant, nursing and growing guinea pigs aged 6 months below to help with development. With adult guinea pigs, it should be served as a treat because daily intake of alfafa might cause them kidney stones. The Thunder Acres Premium Alfafa Hay was grown in the plains of Kansas. It was sun-cured and is free of weed. Your pet will definitely have more on their plates and will be chewing a lot because this alfafa was hand-packed to make sure that it will not be damaged and will retain more leaves. There are a lot of positive reviews about this hay being fresh, fragrant and green. However, you should always be cautious and set your expectations because after all, this is a plant based food and is prone to spoil in a short period. The Oxbow Animal Health Alfafa, like all the other hay in this list, is also hand-picked to ensure that only the best strands of hay are put into every bag that we purchase. It is free from chemical additives and preservatives. One dilemma that guinea pig owners have is how to store the excess hay properly. 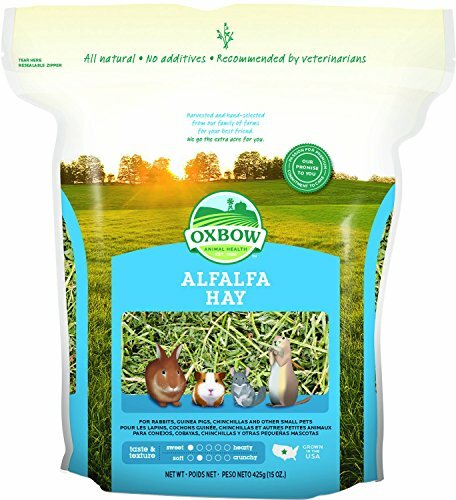 Fortunately, Oxbow’s alfafa is packed in a convenient, mess-free and resealable bag to make storing easier and to help the hay extend its lifespan. However, you must keep in mind that storing hay for too long might spoil. So, it is recommended that you only buy how much you need. Unfortunately, there are more negative than positive reviews for this product. Most of the negative mentions that it is full of dust and half of the bag contain practically dust. So, it may be better to buy this type of products on the pet store to make a better judgement of their quality. What are the characteristics of good guinea pig hay? When selecting hay for your guinea pig, it can be a jungle to figure out: What are the characteristics of good guinea pig hay? When getting guinea pig hay, you should go for something that is not the first cut. The first cut generally refers to the first harvest after winter and this hay is usually stiffer and less desirable than the second or third cutting. If you can answer yes to any of those, you should feed your guinea pig a mixture of 50% timothy hay and 50% alfalfa hay. There is not the same amount choice when it comes to alfalfa hay on the market, but the hay below is a favorite when you need alfalfa hay for your piggy. 5-10% pellets of guinea pig food. One eight of a cup or a little less than an ounce is all they need. If they are fast growing pigs up to the age of 4-6 months, you can double this ratio. Finally, it’s worth pointing out that it’s a very good idea to get a hay rack for your guinea pigs.